Combine juices, mayonnaise in a small bowl and set aside. In a larger bowl, combine chicken, pickles, onions and green onions. Stir in the wet ingredients. Finish with pinch of pepper and salt to taste. Mix well before serving. 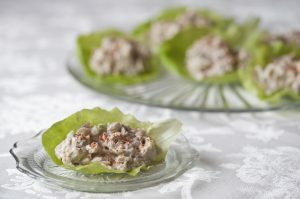 *As a healthy appetizer or light lunch for all your Carb conscious friends and family, serve a spoonful in a crisp Bibb lettuce cup. **As a more filling option, place a heaping spoonful on French bread, a Ciabatta roll or favorite bread of your choice for a one-of-a-kind sandwich!